There was a time when the discrimination on the basis of the caste, creed and religion was high, a particular group of saints landed on the earth to create harmony among the people who were fighting against each other. 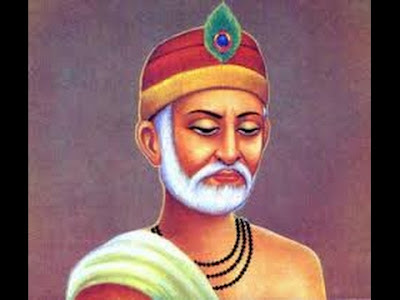 One such legendary figure was the mystic poet and philosopher, saint Kabir Das who was said to be born in Laharatara (kashi) present-day Varanasi in 1398. His birth and death are still a mystery. It is said that he was born in Brahamin widower and brought up by the Muslim couple Neeru and Neema. He preached in the form of couplets that have subtle meanings. "pani kera budbuda us manas ki jaat, dekhat hi chhup jayega jyo taara prabhat"
To know more about such couplets in Hindi please click HERE. During all his life he taught human value and importance of life. He taught the God is unlimited, pure, omniscient, omnipresent and omnipotent. In of his Doha (couplets) reflects the idea of God. Kabir Das was born in the era that was known for utter discrimination of people on the basis of caste, creed and religions. Kabir devoted his entire life in the reconciliation of the Hindus and Muslims. He deliberately abandoned the two faiths and taught a middle path. He spread the simplest message of love and fraternity among all.